Curtis Tilt’s failure to earn a move to Championship side Ipswich Town is ‘unfortunate’ but it’s to Blackpool’s gain, according to team-mate Ollie Turton. Tilt had hoped to seal a deadline day move to Ipswich last month but the deal never materialised, leaving the centre-back with no option but to stay with the Seasiders until January. 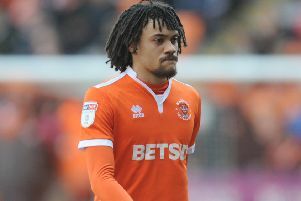 The 27-year-old had been left out of Blackpool’s squad for two straight games but he was brought back into the fold last Saturday to face his hometown club Walsall. He was in imperious form once again as he helped Blackpool keep their fourth clean sheet in the league this season. Turton said: “Obviously, from how well he did last year, he’s always going to strengthen us. “He’s always good to have in the team, he’s athletic and wins all his aerial battles. It’s just nice to have him behind you. You want Curtis Tilt in your team. Turton has been used in midfield in recent games to help protect the back four, as Blackpool continue to look solid at the back. But it is at the other end of the pitch where the Seasiders need to improve. Turton added: “We’ve not conceded a goal away from home yet, hopefully that can continue because we’re looking really strong. “Defensively not many teams have really troubled us, so that needs to carry on.